The DR Front Tine Tiller is perfect for preparing flower beds, weeding small areas, and mixing fertilizer into the soil. The tilling width is versatile because you can rearrange the tine clusters to get three different widths. The rear wheels swing back while tilling, engaging the drag stake to provide resistance against the forward-rotating tines. Easy-starting, OHV engine has 8.0 ft-lbs gross torque (173.9cc). 3700 RPM and Cast Aluminum Bore. Warranted for 2 years (90 days in residential use). Ran for all of 10 minutes before it started leaking gas and quit running. Can't send it back because the container was damaged beyond repair. Nearest service is about a hour away. I'm done with DR.
Have just received the tiller and tried it out in a small area. Seemed to work very well. However your shipping methods could use some improvements as the packaging is not sturdy enough for a heavy piece of equipment as the tiller shield over the tines was bent and the box had several places where the tiller was exposed and had the paint scratched off down to the bare metal. Your customer service dept. did take care of the damage part right away but it still was disappointing to have it arrive in this condition. It is powerful and works well both when busting sod and for tilling a garden. It is hard work, but being a front tine tiller, that’s the nature of the beast. The controls are easy to use. The transport wheel design works well. 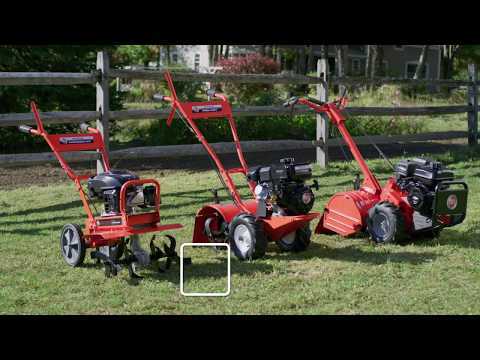 This tiller works good and is powerful enough to get the job done. I wish there were more adjustment holes for the drag stakes and that the handlebars were adjustable. It's great for smaller areas, like flower beds. You're able to change the tilling width, allowing you to get into the smaller areas. Worked good and was powerful. No real surprises. It did everything I expected it to, solid and reliable. Very durable. This tiller definitely gets the job done! This tiller definitely gets the job done! I like the transport wheel design, it works really well. The drag stake is very effective, controlling the forward motion of the unit. It has a long run time on one tank of gas, approximately two hours. The controls work very well, they’re easy to feather to go from a little power to full power when needed. A.Thank you for contacting us regarding the Walk Behind Front Tine Tiller. There is minor assembly required. You will need to attach the handlebars, tines, and wheels to the machine. Then add gas and oil and you're ready to go! A.Thank you for your interest in the Front Tine Walk Behind Tiller. It is not truly self propelled, but the tines do rotate in a forward motion, "propelling" the machine. By setting the depth stake at the proper height, you are able to slow the forward momentum, dependent on the soil conditions. Please feel free to contact us if you have any other questions. Q.How do I move this to my garden? A.The Front Tine Tiller has "transport wheels". The wheels pivot under the machine, allowing you to lift the tines off the ground for easy transport. When you're ready to til, just lift the handlebars, causing the wheels to swing back and out and you're ready to go!